Rockland All Saints tower windmill was one of the latest to be built in c.1850, adjacent to the Mill House. The parish was later amalgamated with Rockland St Andrew just to the south. 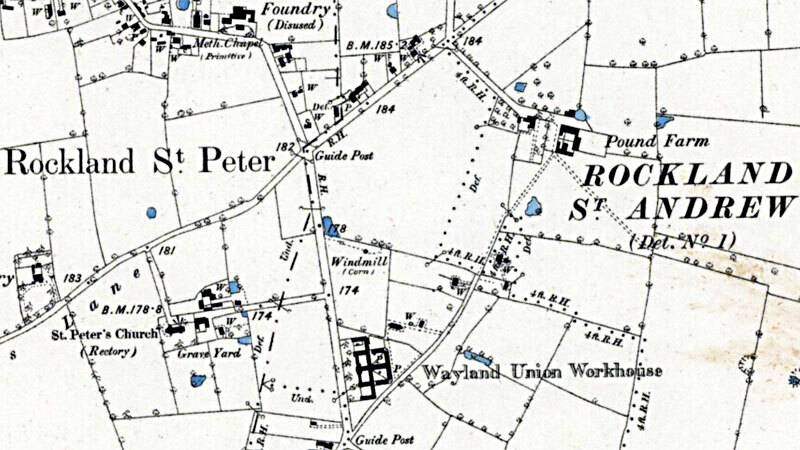 The mill stood between the two parishes just to the north of the former Wayland Union Workhouse. The 5 storey mill had a Norfolk boat shaped cap with a gallery and an 8 bladed fan. The four double shuttered patent sails each had 8 bays of 3 shutters and drove 2 pairs of stones. A steam mill driving a further two pairs of stones was working alongside the mill by 1865 and a baking office was being run by 1854.
re William Dunthorne deceased of Rockland St. Andrew, Miller. To be Let from the 11th October next, a good BRICK TOWER WIND CORN MILL and a STEAM MILL. Apply to Mr. Wm. Dunthorne, Miller, Rockland or to Mr. Jesse Feltham, Solr. Hingham. To be Let with immediate possession a Tower Brick WIND CORN MILL and outbuildings and about 3 acres of Land. Apply a WATER MILL HOUSE with STEAM MILL the property of Mr. Wm. Dunthorne. Apply to Mr. James Feltham, Solrs. Hingham, Attleborough. To be Let. A Brick Tower WINDMILL driving two pairs of stones with a small Residence and 2a. 2r. 8p. of excellent Land. Also a STEAM MILL driving two pairs of stones. Apply to Mr. William Dunthorne on the spot or to Mr. James Feltham, Solr. Hingham, Attleborough. To be SOLD, a Brick Tower WINDMILL with Outbuildings and about 2a. 2r. 8p. of Land. Also a substantial DWELLING HOUSE with Baking Offices, Cottages and other Outbuildings and Land and Steam Mill. The whole are in the occupation of Mr. William Dunthorne and his Tenants. All Freehold. Apply to him or to Mr. James Feltham, Solr. Hingham. Messrs. Bacon & Sons will Sell by Auction at the White Hart Inn, Rockland on Monday 27 July 1885 at 5 for 6 o'c in the Afternoon, the following PROPERTY in two Lots. Lot 1. A Parcel of valuable LAND in Rockland, near Attleborough and Hingham aforesaid, containing 2a. 2r. 8p. with the newly erected lofty Tower WINDMILL and Buildings next the public road and by lands of Sir William Bowyer SMITH, Bart., Mr. William Lebbell and Wayland Union House and now in the occupation of Mr. William Dunthorn. Lot 2. A newly erected Messuage or DWELLING HOUSE, BAKING OFFICE, WATERMILL HOUSE, STEAM MILL, FLOUR MILL and Machinery, Outbuildings, two COTTAGES and LAND in Rockland aforesaid, near Lot 1, in the occupation of Mr. William Dunthorn and others. Freehold. Apply to Mr. Dunthorn, who will shew the Estates or to Mr. James Feltham, Solr. Hingham or to the Auctioneers, Attleborough. In October 1973, Philip Unwin recorded that the when dismantled in 1920, the sails were painted half red and half white, the fan was painted red, white and blue and the petticoat was painted red and white.